A view from the deck of a river boat (a paddle-steamer? ), a rope line of the boat seen hanging down on the right of the image, across the calm water of a lagoon in western Nuerland, probably near the mouth of the Sobat, since other images from this film relate to the river. Just visible are three men sitting in a dug-out canoe paddling near the far bank. Note on print reverse ms pencil - "1 W. Nuer" & print front border ms ink - "NUER IV/72"
Morton, Chris. 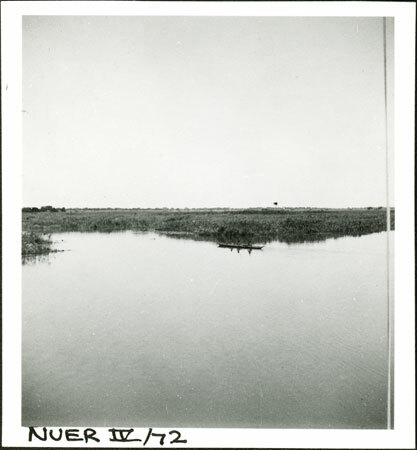 "View of ?Sobat River" Southern Sudan Project (in development). 03 Jan. 2006. Pitt Rivers Museum. <http://southernsudan.prm.ox.ac.uk/details/1998.355.184.2/>.